If you want a detailed history of calligraphy, look elsewhere. If you want a beginner-friendly book that uses a different technique (tracing!) to get you started quickly putting pen to paper, this is a great choice. While it only covers 4 period hands and one modern teaching hand, it does so in a very accessible way. It also includes a great deal of information on tools and techniques a new calligrapher will need, and transparent guideline sheets to match each of the 5 hands it teaches. Please note: you will need a 2mm wide calligraphy pen and translucent tracing vellum to use the book as intended. I would have preferred to see the scripts presented in a different order: Foundational (a modern teaching hand), followed by Carolingian, Italic, Uncial then finally Gothic. But this is a minor thing, especially considering the instructional method. There's also nothing stopping you from practicing the scripts in that order instead. The real strength of this book is that it allows students to jump very quickly into making letters. By comparing your letters to the example you are tracing you can immediately see what you did right, and what you didn't. 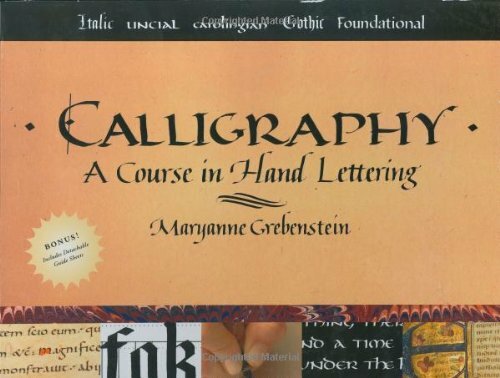 If you are new to calligraphy, and frustrated or intimidated by creating letters freehand, this book offers a great alternative way to get started. Grebenstein starts by explaining that she "created [the book] specifically for students who have little or no previous experience in the lettering arts". She continues her welcome by briefly talking about how the skills for writing calligraphy differ from those used in modern handwriting. This chapter provides some light history of calligraphy, as well as color images of several period examples to serve as inspiration and help the reader understand what medieval calligraphy looked like. While there aren't as many images as some other books, what is included certainly help the reader understand enough of the history of calligraphy to whet their appetite for more. This short chapter explains the layout and order of the book, explains about the inclusion of transparent guideline sheets, and that the exercises in book are designed for a 2mm nib. This chapter discusses her recommended writing area setup: including table, slope, lighting, placement of tools, paper orientation, and blotter use. Two supplies lists are provided: Basic & Advanced. I agree almost completely with her recommended list of tools and supplies. She leaves off the AMES guide, which I disagree with, but I understand that many people prefer to line the page using rulers instead. Given that this book has a fairly beginner focus, it's an understandable omission. Next she launches into information on how to use a broad-edged pen. She talks in some detail about pen angle, pen scale (minim height in nib widths), nib width, x-height (which I prefer to call minim height) how to make a "checkerboard" (or ladder) to determine minim height based on a certain number of nib widths, letter slope (the angle the vertical strokes of letters are drawn at), ascenders and descenders. As these terms are explained they are clearly diagrammed to the side of the text. Definitions provided, the next couple pages explain briefly how to measure and apply them in practice. Finally, she talks about letter spacing and how to use her guideline sheets. While the basics are covered, there are no pen practice exercises specified before the book jumps right into each script. The scripts chapters do include practice of the strokes used in that particular script, but I feel that a new calligrapher would benefit from some guided practice to become comfortable with the pen. That said, she does cover much of this with how she has the student learn each script. Each of the script chapters is organized same general way, and present a unique way of teaching a new calligrapher: tracing. The chapters start with a paragraph or two describing the history of the script. The student is directed to begin the process of learning the script by tracing the "skeletal" shapes of the letters soft pencil on translucent tracing vellum. Grebenstein explains that the thicks and thins of a calligraphy pen can be distracting at this point, and the goal is to become comfortable with the general letter shape and strokes involved. The next page presents basic strokes used to make up the letters as penned with a wide-nib calligraphy pen. The student is directed to trace them using a 2mm nib to become familiar with the individual strokes. The tracing exercise completes with the full alphabet. Once the student is comfortable with tracing the letters, they are directed to practice the lettering freehand on tracing vellum over the guideline sheets to keep the letter height and angle consistent. In addition to presenting exercises for learning each hand, she also includes instruction and tracing guides on creating arabic numbers, capital letters for Italic, Gothic and Foundational hands, punctuation for Italic, Uncial and Foundational, and serifs or flourishes for Italic and Uncial. Making guidelines using a T-square (or optionally triangle), pencil and a "paper ruler". This is a quick and easy method for making your own guidelines, but potentially slow and not as consistent as I'd like. She makes a couple statements I don't agree with as well: HB is not a "very hard" lead, it's actually right in the middle of the hardness scale, and is the same as a #2. Similarly, a #1 pencil is not "very soft", it's one step softer than a #2. Yes, I'm being pedantic about these details. In the end, it doesn't matter what pencil hardness you use as long as it works for you! Using a light box, and when you might want to. Using an electric eraser. This is a tool I don't own yet, and want to, thanks to this book. The final chapter starts with encouragement to the reader to move beyond practicing the alphabets and use them for something. Grebenstein makes some great points about the process of creating original layouts and balancing them visually. I particularly like her ideas around "thumbnail sketches" as well as full size sketches to check for fitment. This is a lot of work, but it can definitely help. She does recommend completely penciling in the text on the finished piece, and then essentially inking over it. As you start calligraphy, this technique can definitely help insure the text will fit correctly and you have the spacing correct. I rarely use this technique myself, but if it works for you to help give you the result you want, great! The book finishes with five short quotations she suggests you use to create final projects for each hand.